Welcome to Inwood on the Park! Walk to UT Southwestern Medical Center! TEXT Inwood to 47464 to get information on your cell phone anytime! GORGEOUS NEWLY UPGRADED HOMES WITH WOOD FLOORING, GLASS BACKSPLASH, STAINED KITCHEN CABINETS AND MUCH MORE!! 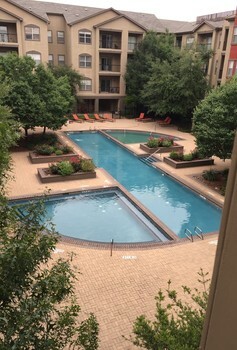 Controlled Access Entry, Garage parking with remote access, Additional storage available, Resort-style pool, Jacuzzi, Fitness center, Business center, Koi pond with gazebo, Wooded Greenbelt area. High speed DSL and U-verse internet. Directly across the street from UT Southwestern Medical Center. Professional, Caring Management and Service Team, Pet friendly surrounding, Community Clothes care center, Monthly Resident Social Events. Built-in computer desks in many floorplans, upgraded apartment homes available.